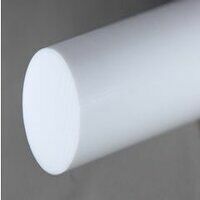 View our range of PTFE plastic rod here at Bearingboys. PTFE rod (also known as Teflon) has the lowest co-efficient of friction of any solid material and is greatly effective operating at extreme temperatures. This rod also has a fantastic chemical resistance and excellent electrical insulation properties. All next working day delivery orders must be placed by 2.00pm for same day dispatched.